A lovely and unusual bulbous plant from the Cape Floral Kingdom in South Africa with clusters of orange (sometimes yellow) flowers in March/April and May. Grows to a height of about 30cm, so good for the front of a border or pots. This is a wonderful cut flower as well, becoming increasingly popular with florists as it will last up to two weeks in a vase. 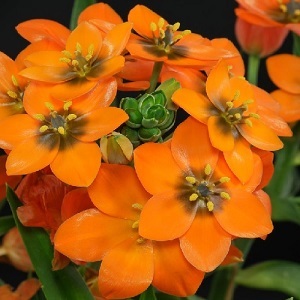 Ornithogalum dubium grows best in good sunlight and rich well drained soils. Plants grow well in gardens and in pots. They are only just-hardy for the UK, so in autumn plant the bulbs either directly into the ground in the warmest gardens or into pots, and kept indoors or in a greenhouse over winter. They make great house or conservatory plants and will flower earlier in the year when kept indoors in winter. Pack of 6 bulbs. These are good-sized nursery-raised bulbs which nearly always flower in the first season. The bulbs of this species are sometimes dormant in some years, so do not discard the bulbs too readily. Planting instructions and a colour photo are printed on the packet. Plant bulbs in autumn from September to November/December 5-10cm deep (with the neck of the bulb just below soil level) and 10-15cm apart in warmer UK gardens. Otherwise plant 6 bulbs in a 15cm pot in well drained gritty compost. Plants need good light in winter.. Remove dead flower stalks. Let the leaves die down after flowering and remove when they have browned. Lift and divide the bulbs in the summer, when plants become congested, to maintain flowering. Remove and re-plant the offsets that form alongside the mature bulbs. Bulbs flower for many years.